Anyone who collects contemporary baseball cards knows that action shots are in full supply. In the current market, most players are shown “in action” on their Topps cards, whether it’s in the act of hitting, running, fielding, or pitching. In contrast, cards that display players in either portraits or profiles, or those that feature players posing to simulate the act of swinging the bat or pitching the ball, have become the rarity. The reverse situation existed throughout the 1950s and ’60s. Players were shown either in portrait, usually from a straight-ahead vantage point but occasionally in profile, or in some kind of a posed situation on the ball field. It was common to see a close-up head shot of a ballplayer one year, followed by that same ballplayer pretending to swing a bat, or lay down a bunt, the next year. Action photographs were reserved for World Series cards and other “special” cards, and even then they were usually black-and-white images that were occasionally colorized. Color action photography, whether it was limited in supply or simply more expensive to reproduce, was not the norm. In 1971, Topps made a revolutionary change to its presentation. As part of its memorable black-bordered set, Topps began to feature cards of players in action. These are not simulated situations or posed shots, or drawings of players in action, but rather full-card photographs of actual game action—and in full color. Most of the photographs were snapped at the two New York ballparks, Shea Stadium and the original Yankee Stadium, since both were located so close to the Topps headquarters. A few came from ancient and decrepit Connie Mack Stadium, wading through its final season of existence in Philadelphia before giving way to Veterans Stadium. For the first time ever, Topps shows us players like Joe Morgan and Art Shamsky, each standing next to the catcher and the umpire, as an actual pitch is being delivered. The groundbreaking set includes a terrific landscape shot of Thurman Munson (profiled earlier in this space), seen trying to elude Chuck Dobson’s spiked shoes amidst a cloud of dirt at home plate. We also see players like Oscar Gamble, Bob Oliver, and Roy White at the plate, taking (or about to take) real swings against opposing pitchers. Topps also includes pitchers in the action fray, with notable hurlers like Nolan Ryan, Tommy John, and Fritz Peterson, seen in the midst of their distinctive deliveries. While Ryan has his own card, he also makes an appearance on one of his teammate’s cards. Ryan appears most prominently, his No. 30 uniform visible in the foreground as he tries to coax the umpire into making an out call. But the card is actually meant to depict shortstop Bud Harrelson, who can be seen on the far left trying to apply a tag to an Astros baserunner. In fact, four players make appearances on the cards, in addition to the second base umpire, who is wearing the distinctive all-black umpiring uniform of the era. Harrelson and Ryan are easy to identify. But who are the others? The Mets second baseman backing up the throw is Ken Boswell, with the “2” on his No. 12 being visible on the front of his pinstriped uniform. In regards to the Astros’ baserunner, I’ve heard some people suggest that it is Joe Morgan, which is possible. But I believe that it is Jimmy Wynn, an African-American player of similar build and height to Morgan, but whose face and head more resembled the player on this card. This play took place on May 30, a Saturday afternoon, during the 1970 season, the only game in which Ryan faced the Astros at Shea Stadium that summer. In the top of the eighth inning, Wynn took off for second and was ruled safe by the umpire, the late Ken Burkhart. Wynn would come home to score on Norm Miller’s single, giving the Astros a 3-1 lead. But Wynn’s insurance run would not be enough; the Mets would rally to score three runs in the bottom of the eighth, for a most dramatic 4-3 victory at Shea. So while the Astros won the baseball card, the Mets won the game. With the details of the game and the identities of the players in place, let’s not give short shrift to Derrel McKinley Harrelson, the featured player on the card. For years I had mistakenly assumed that Buddy was the brother of Hawk Harrelson, the slugging American League first baseman. Its funny how the mind of an eight-year-old works. If they have the same last name, and they both play baseball, they must be brothers! With his quick feet, Harrelson scooted and scampered toward ground balls on the left side of the infield, making him especially important to left-handed pitchers like Jerry Koosman, Tug McGraw, and Jon Matlack, who joined the staff for the first time in 1971. Harrelson also had soft hands, a quick release, and a surprisingly strong arm. As an offensive player, Harrelson often looked out of place. First of all, he was so damn small; he looked like a Little Leaguer playing against college ballplayers. Listed at 5-foot-11 and 165 pounds, he looked more like 5-foot-7 and 140 pounds. A stiff wind could have knocked him out of the batter’s box, not to mention a Bob Gibson or a Bob Veale fastball. He also had a tendency to lose weight during the season, a good problem to have if you’re George Scott, but not if you’re built like Twiggy. Yet, Harrelson made do, even with his limitations. A self-taught switch-hitter, he slapped the ball from both sides of the plate, bunted the ball exceptionally well, stole bases when the situation warranted, and, as a testament to his smartness, took lots and lots of pitches. Harrelson understood that with his lack of power—e hit a grand total of seven home runs in 15 seasons—a walk meant just about as much as a hit. Harrelson was so willing to take a walk that he could sometimes fill the role as a second-place hitter, even though he was ideally targeted to bat eighth. In 1970, Harrelson drew 94 walks, a remarkable total for a .243 hitter who finished the season with one home run. I would imagine that he mixed in quite a few foul balls during those at-bats, helping raise the pitcher’s count while giving himself one more chance to reach first base via base on balls. He would never come close to coaxing that many walks in another season, but he would consistently draw in the 50-70 range. That’s why Harrelson finished with a career on-base percentage that was nearly 90 points higher than his career batting average. 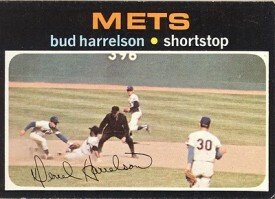 Harrelson lasted 13 seasons as the Mets shortstop. I doubt that would have happened in today’s game, where there is so much emphasis on offensive-minded shortstops. But in the game of the ’60s and ’70s, Harrelson was more than adequate, just like the Mark Belangers, the Eddie Brinkmans, the Roger Metzgers and the Gene Michaels of that era. When the Mets brought Tim Foli back as their shortstop in 1978, they deemed the aging Harrelson and his .178 batting average expendable. In exchange for an obscure second baseman named Fred Andrews, the Mets traded Harrelson to the Phillies, where he “reunited” with Pete Rose, who along with Joe Morgan had tried to bully Harrelson during the 1973 National League Championship Series. After Jon Matlackhad shut down the Reds in Game Three, Harrelson offered up a memorable quotation. “(Matlack) made the Big Red Machine look like me today.” It was a relatively innocuous comment that was actually more self-deprecating than anything else, but some of the haughtier Reds took it as an insult. Morgan confronted Harrelson before Game Three, warning him that Rose was particularly upset about the remark. So Rose went out of his way to body-block Harrelson on a double-play attempt, and during the course of his slide, elbowed Harrelson. Buddy told Rose that it was a cheap shot, among other pleasantries. Rose grabbed Harrelson, but the little shortstop did not back down. He and Rose wrestled each other to the ground. As the two combatants initiated a bench-clearing brawl, Harrelson conceded about 40 pounds of muscle to Rose. Yet, he won f the praise of thousands of Mets fans, along with this Yankees fan, who admired Harrelson’s willingness to stand up, the little guy against the bully. As far as I know, Harrelson and Rose coexisted as teammates without incident. Harrelson became eligible for free agency after the 1979 season and signed with the Rangers for one season before retiring. If Harrelson could have called a do-over, he might have stayed with the Phillies for the 1980 season and picked up the second World Series ring of his career. But without the benefit of foresight, Harrelson instead opted for his only taste of the American League. I don’t know that too many fans remember Harrelson as a Ranger. Perhaps a few remember his days with the Phillies as a utility player. When we think of Harrelson, we think of the Mets, and that’s the way it should be. And if you’re a Mets fan who happens to collect cards, then the 1971 Topps card, with the added bonus of Nolan Ryan, is clearly the one to have. I notice that both Morgan and Wynn had stolen bases in the game you mentioned. I can’t tell by looking at the card if it is Morgan or Wynn. What I do notice is that the center fielder is not visible in the picture. I would tend to believe that whoever was batting may have been right handed. The batter when Morgan stole 2B (Wynn~ RH), the batter when Wynn stole 2B (Miller~ LH). Not sure about this, but just throwing something out there to ponder. Bucco, it’s certainly possible that it is Morgan. His stolen base came in the sixth inning; Wynn’s was in the eighth. From the side, it looks a little more like Wynn, but it’s hard to be 100 per cent certain on this one. Good point about those horizontal 1971’s. They do like little television screens. I’m trying to remember if we had a color TV in 1971. We might have still been in the black-and-white phase. If Harrelson was covering on the steal is it more likely it was a LH batter, implying Wynn was the base stealer? I’m pretty sure that Tommie Agee’s 1971 card shows a play in the same game. I think it would be amazing if Topps would re-use the 1971 or 1973 style, instead of the same white border design they seem to use almost every year. Tim, I just took a look at the 1971 Tommie Agee. Another great card. I think it’s Rusty Staub and Joe Morgan in the picture. I like how they’re both looking for the ball, but the ball isn’t even in the picture. Glenn, I don’t think that any major leaguers wore beards in 1970. But I still think it’s Wynn, based mostly on the shape of his face and head. Bruce, Staub was already on the Expos. I think it’s gotta be Denis Menke, if it is the May 30 game. Also, it looks like the ump is about to call Agee out, which makes no sense, considering the ball is nowhere to be found.